Your oral health can be impacted as you age. Crowns and veneers do not last forever. Gums may recede, and tooth loss may require partial dentures, bridges or implants. No matter your age, it’s never too late to improve your oral care and work with your dentist to positively impact your overall health. Older adults are more prone to cavities and decay on the root surfaces of their teeth. Visiting your dentist on a regular basis, along with normal oral health routines, like brushing and flossing, can help prevent this. Sensitive teeth and receding gums are common issues and only increase with age. As your gums begin to recede, the areas of your teeth that do not have enamel start to become exposed, leaving them prone to sensitivity. Brushing with sensitive toothpaste can help, along with seeing your dentist. Medical conditions and medications can impact your teeth dramatically. One of the more common issues is dry mouth, which means less moisture is produced in your mouth, leaving it less cleansed and protected. Your dentist can recommend treatments and medications to assist with dry mouth that can help restore saliva production. People over the age of 40 are at a higher risk for gum disease (Sources: ADA). Many things can increase the progression of gum disease: poor oral hygiene, a bad diet, stress, diseases like diabetes and cancer, medications and personal choices such as smoking. Always let your dentist know about existing medical conditions you have. Common senior health conditions like diabetes, heart disease, and even cancer can affect oral health. When your dentist understands your medical conditions, he or she can better recommend treatments and care for your oral health. 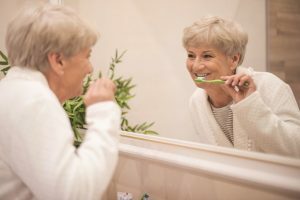 By maintaining healthy oral habits at home, making smart choices about diet and lifestyle, and seeking regular dental care, you can help your teeth last a lifetime—whether you have your natural teeth, implants or wear dentures. You can learn more about oral concerns in adults over the age of 60, such as the link between medications and cavities, gum disease and mouth cancer from the American Dental Association. FirstLight Home Care provides a variety of personal care services and aid to assist with hygiene activities, including oral health. Contact FirstLight Home Care today to learn more about our Personal Care and other home care services.